Dear friends. I, Zeb the Duck, feel I must warn you. Mom found a new website that lists over 1200 national days. Be warned, she found so many crazy national days here. 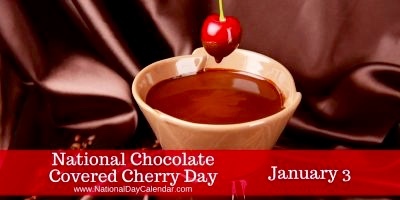 Today, is National Chocolate Covered Cherries Day, and mom loves chocolate covered cherries. We Colorado Traveling Ducks will try to control her urge to tell you about all of over 1200 national days, but she doesn’t always listen to us. So, today we hope you enjoy some delicious chocolate covered cherries, or as they are also know, some chocolate cordials. This entry was posted in Holidays, Uncategorized and tagged chocolate cordials, Colorado Traveling Ducks, National chocolate covered cherries day. Bookmark the permalink. Zeb, chocolate covered cherries are awesome. I agree with Mom. Darn, I missed it! I hope you do post more special days. It’s fun. Oh Mrs. ET. Don’t encourage her too much. She has a couple more scheduled for January. We do love them, but there are so many listed. But we do sample most of what she writes about. The chocolate covered cherries were delicious! Thanks for reading and commenting.